The present chapter discusses some of the roles that referential communication tasks have been argued to play in L2 performance and acquisition. Referential communication tasks are first defined in the way that it will be used throughout the book. A distinction is then made between two types of communication: (1) interactional communication, which is listener focused, and (2) transactional communication, which is message focused. This distinction is then elaborated into a discussion of specific constraints on task performance which optimize communication regardless of whether learners are using their L1 as children or using an additional language as adults. 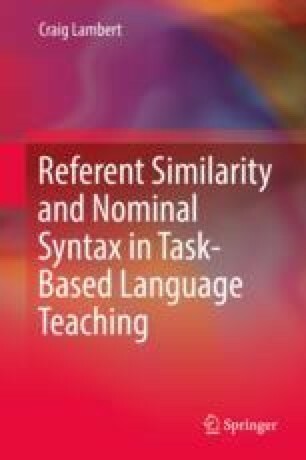 Following this, an approach to classifying and sequencing referential communication tasks in L2 instruction is outlined. In this approach, the functional demands of different discourse genres (i.e., description, instruction, narration and exposition) are argued to be related to conceptually motivated aspects of the developing language system. A discussion of the limitations of tasks in pushing some redundant aspects of language is then provided together with some possible ways of addressing this problem. The chapter closes with a discussion of the potential mediating effects of proficiency in task performance.